Euclid, a fast-growing technology start-up, helps brick-and-mortar retailers optimize marketing, merchandising, and operations performance by measuring foot traffic, store visits, walk-by conversion, bounce rate, visit duration, and customer loyalty. The company has a network of traffic counting sensors in nearly 400 shopping centers, malls, and street locations around the United States. Euclid provides aggregated, anonymous data that measures more than 21 million shopping sessions a month across the United States in specialty retail, department stores, shopping malls, and big-box retail. Euclid is located in Palo Alto, CA. Euclid uses technology provided by Heroku—an Advanced Technology Partner in the Amazon Partner Network (APN)—for its web layer and has always run on Amazon Web Services (AWS). Euclid stores information on Amazon Simple Storage Service (Amazon S3), and processes data in parallel with Amazon Elastic MapReduce (Amazon EMR). Euclid’s engineers write and test code directly on Amazon EC2 instances. This allows them to work from any location, access unlimited bandwidth, and move data around easily and quickly at a speed of up to 25 MB per second. Euclid uses three Amazon EC2 instances to process data and AWS Elastic Beanstalk for load balancing and auto scaling. 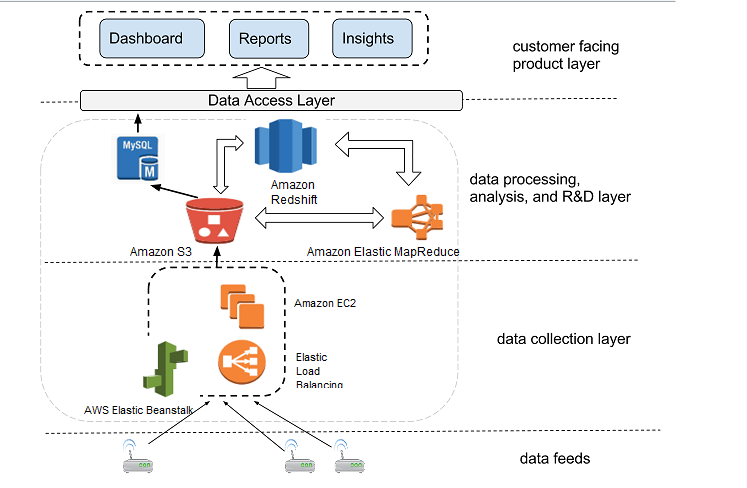 Euclid stores up to 30 GB of uncompressed data per day in Amazon S3. The analytics team leverages Amazon EMR and Hadoop to aggregate and analyze data. “Amazon EMR does most of the heavy lifting,” says Leung. “I used Hadoop in my previous work and we had to spend time installing and managing the cluster. We don’t have to do that with AWS. We only use the service when we need it, which is a great cost savings.” Figure 1 below demonstrates Euclid’s environment on AWS. To learn more about how AWS can help your data workload needs, visit our Big Data on AWS details page: http://aws.amazon.com/big-data/. For more information about how Heroku can help your company run on the AWS Cloud, see Heroku's listing in the AWS Partner Directory.